First, you have to click on the chips so that you can select a certain value, after that, you have to click so as to place the chip on a place marked ANTE. For every left-click, your bet amount increases but for every right click, the amount is decreased. For this game, you are required to place at some point an additional bet hence your balance have to be enough always so that it can easily cover for that bet. 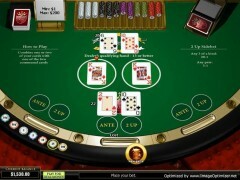 For the additional bet, it is normally the same amount to the ante amount you have placed. For those people who’s their balances are not enough, they usually receive a warning while playing the game. For you to get a side bet, you have to click on a place marked 2 UP, however, it isn’t mandatory. When you click at the Deal button, you will get two cards, one that is facing down and the other up. Also the dealer will be provided with two cards that are facing down. At the centre of the table, two more cards facing up will then be placed. These two cards that are placed on the table are known as communal cards which are used by your hand and also the dealer’s hand. After you have been provided with these cards, you have some options to consider. You can choose to fold where you lose the ante bet by ending the round. Even if you had won by placing the 2 Up sidebeat, you will still receive all your winnings. For the Right card/Left card, with the face-up card that you have, choose one of the provided communal cards and use it. At the corresponding button, click, or even click on any of the communal cards provided. While playing this game, you have to know that you will always have to place additional bet if you want to continue playing. After the total of the communal card that you have chosen and the face up card that is yours is shown, you are left to follow some options. You can also choose to hit, where you add to the hand the face-down card. However, when you do so, you may lose the round if your point total is more than 21. You may also choose to stand, where you will continue to play with two cards after discarding the face-card down.